Another victim of East Tremont Avenue. 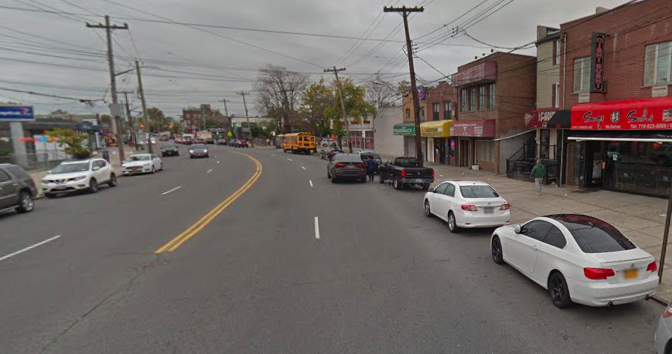 A driver ran over and killed a senior citizen a few steps from her home on Miles Avenue in the dangerous Throgs Neck section of the Bronx, but was finally arrested in March after a lengthy investigation, the NYPD said. The crash occurred on Dec. 16 at around 1:05 p.m. when Maria Frasca, 85, was attempting to cross East Tremont Avenue. At the same time, a driver — whom cops ID’d as Marilyn Mateo, 44 — turned into the road from Miles Avenue, hitting Frasca. Cops say Frasca was conscious after the collision, but died later at Jacoby Hospital. Mateo had remained on the scene and was not immediately charged. But on March 13, the NYPD said Mateo had been charged with failure to yield and failure to exercise due care. One pedestrian was injured at the same intersection this year. And just north of the intersection, on East Tremont Avenue, nine pedestrians and cyclists have been killed in just a 15-block stretch since January, 2017, thanks to an overly wide street that encourages speeding — the very conditions that the Department of Transportation will fix along similarly designed Morris Park Avenue next year. Story was updated on March 13 to include arrest details. I am ready to ask the Community Board to ask the DOT to complete the Tremont Ave. Vision Zero High Priority Roadway Study and implement some safety measures to protect pedestrians on this wide roadway.